Thank you for visiting the Leadership Training Program website. These trainings are a combination of leadership knowledge and skills delivered by professional speakers, which has been carefully balance with experiential learning “Events” giving each attending participant hands on experience applying leadership in a practical manner. Our events consist of Leadership Reaction Course, Ropes Course and Ground Based Initiative events that are physically, mentally and emotionally challenging. These events are designed to build character, stimulate mature attitudes and assist teenagers in developing the life skills that will allow them to be successful as adolescents and later as adults. This training is recommended for all teens, and is particularly helpful for student leaders such as student council, sports team leadership, and JROTC cadets who wish to advance in their JROTC unit. We also have curriculum which has been derived from MCJROTC curriculum and which is ideal for those cadets in Marine Corps JROTC units. Graduates enjoy the benefits which result from higher levels of responsibility and accountability, topics which are stressed throughout the camp. **This training is not comparable to orientation camps or mini-boot camp style camps which focus on physical fitness and obedience. This training is specifically designed for up and coming leaders. This is an intense leadership training course designed to produce leaders who can succeed in any endeavor of adolescent and adult life. This is training for future officers of the military, captains of industry, political leaders, government & public service leaders and the heads of organizations of all types. Our training method is a balance of "experiential" with "instructional". Students learn best by doing, failing, trying it again, and finally getting it right. Experiential training subscribes to the proposition that we learn more from our mistakes and failures, than we do from our successes. Students come to relish every success and failure they are able to garner at our camps, and they soon learn that both of these result in the kinds of valuable life lessons that are not soon forgotten. *** It should be noted that we have a program which is entirely experiential, is designed to test and advance leadership skills and which is typically only appropriate for students who are already high performing leaders. Our camps accommodate a minimum of 50 participants (coed) and we have five or more qualified male and female instructors on hand at all times, in addition to any Instructor/Chaperones from schools sending attendees. Not counting Instructors, this is a ratio of one instructor per ten participants which is more than the ACCT requirement of one instructor for 15 participants. Our instructors are all certified to ACCT standards (Association for Challenge Course Technology) who facilitate all of our events alongside Marine Corps Instructors. All of our instructors have had fingerprint background checks, local, state & FBI and have been cleared to work with adolescents. Students better prepared for leadership billets and who will be motivated to stay in leadership programs through high school. Students who are moving towards adulthood, ready to put aside the things of childhood, and start taking more responsibility for themselves and their lives. Students who embrace challenges with a can-do attitude. Students who understand that all failure moves them a step closer to success. Students who will seriously start considering a college education as a possible goal. Students who have learned to resolve conflict for the benefit of all concerned. 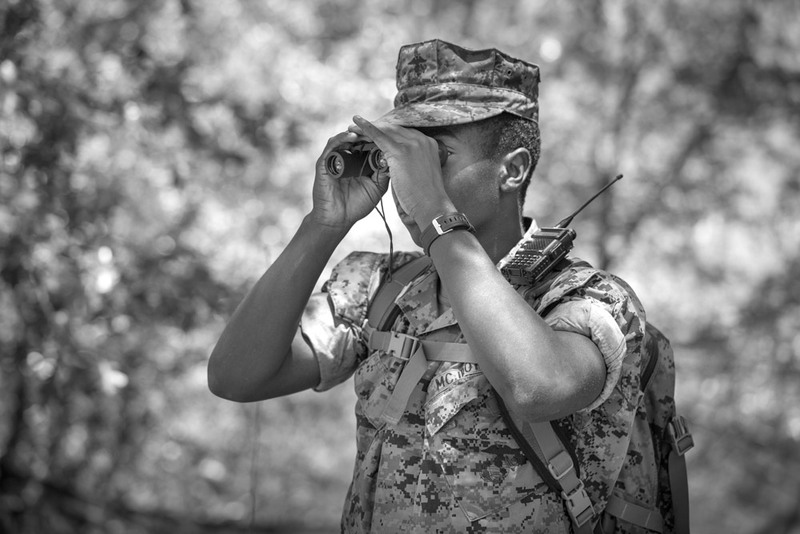 Students who are familiar with, and ready to embrace and practice, the Leadership Styles, Principles and Traits they have learned at our camps when they rejoin their units. We are training the leaders of tomorrow who will be directing our military, businesses, industries, and government. We are very passionate about our work, and very compassionate for the cadets placed in our charge during these trainings. "Their future is in our hands"